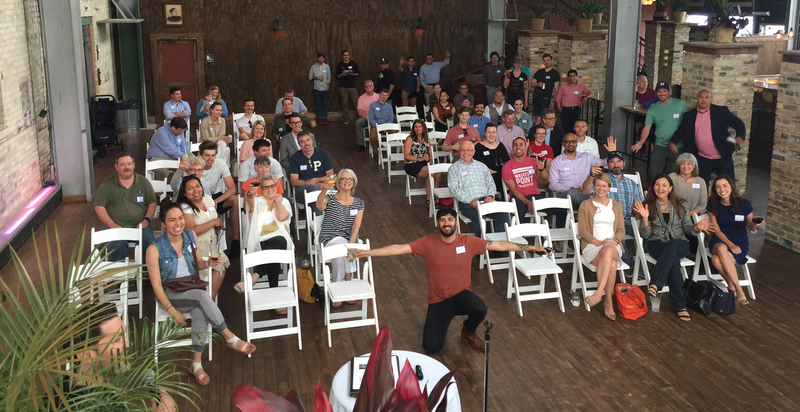 If you were not able to join us on May 29th at 6pm, the Cooperage Staff and the WPA Board of Directors greeted nearly 100 residents, businesses owners and friends. Kevin Wondra, President of WPA, welcomed us and thanked the owner of The Cooperage, Derek Collins for graciously hosting in this beautiful event space. Police from District 1, Officer Kline and District 2, Officer Vodica spoke. There was no new crimes to report but a significant amount of time was spent talking to the details about the recent news about the MPD and Bucks player, Sterling Brown. The MPD has chosen to be transparent about the event and answered many of our questions. Resident, Harvey Kurtz reported on the Walkers Point Safety Network accomplishments such as relaying the importance of reporting ALL crime AND suspicious activity in order to gain traction for increasing police presence in the Walkers Point neighborhood. Additionally, they have been mapping cameras and creating a social media safety education campaign in the business districts. These initiatives require more volunteers. If you are interested in participating, please contact Harvey at harvey.kurtz75@gmail.com. Meanwhile, remember to dial “9” after you call 911. Thank you to Ellen Homb of 2-Story marketing and promotions, for donating her time and her staff’s time to produce a new information hub for us: www.Walkerspointassocition.org. It has launched in May and thank you to Ivan Mejias for his work to translate and publish the site in a Spanish coming soon. New this year, Membership Committee was added in order to support business sponsorship of the Walkers Point Association. In exchange for dues (that pay for residential and community gatherings, social media support, and website support, and 5th street festival) business sponsors receive regular ongoing promotion through our weekly social media, Website, and 5th Street Festival. The ultimate goal of membership is to increase communication and awareness of all people in the neighborhood. Membership committee worked towards launch of a new website to house all the social media posts, relay in Spanish (coming thanks to Ivan Mejias), and promote connecting each other while working as a neighborhood. We also began a process for welcoming all new members and encouraging business engagement. In summary: over 500 businesses in Walkers point. Over 50 businesses and hundreds of residents participate in WPA. Additionally, over 3000 individuals follow what is happening in Walkers Point. There is plenty of room for more resident and business members. 5th Street Fest is scheduled for September 22rd! Mark your calendars for that afternoon until 10pm. See www.5thstreetfest.com and stay tuned for more information. Thank you to Cristian Vega of Screaming Tuna for heading that initiative. Thank you to all that attended our 2018 Annual WPA gathering.